BETHLEHEM (Ma’an) — Palestinians have suffered in many ways as a result of the Israeli separation wall, and in the case of one family in al-Walajah west of Bethlehem, the wall separates them from the graves of their relatives. Ahmad Barghouth, 66, told Ma’an he buried his parents and grandparents years ago in his field near his home. But the Israeli separation wall was built on his land between the small family cemetery and his house. When Barghouth saw the blueprints of the wall, he knew that the route of the wall would isolate his family’s graves, he said. But he can visit the graves through a small tunnel under the separation wall — Barghouth managed to obtain permission for the tunnel from the Israeli Supreme Court. The tunnel was built with an iron gate at the entrance, and the keys were given to the family. During a tour with a Ma’an reporter, Barghouth’s 46-year-old son Nidal explained that his family lost vast areas of its agricultural land to the separation wall. “Watch that excavator over there uprooting trees which were planted centuries ago,” he said as a bulldozer uprooted olive trees. 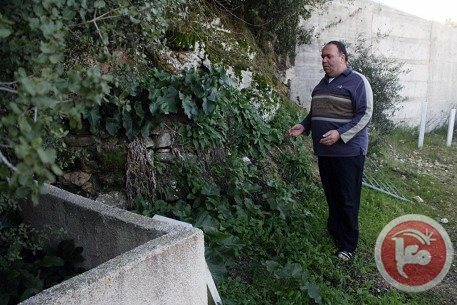 The mayor of al-Walajah, Abd al-Rahman Abu al-Teen, says the village has been underserved and even ignored by the Palestinian Authority. “A few years ago, a PA official visited the village to check on a project,” Abu al-Teen said. The separation wall, the construction of which began in 2003, contributes to massive Israeli restrictions on Palestinians’ freedom of movement within their internationally recognized territories.